First, let’s play a game: use voice-to-text on your phone to say “Shakshuka” (pronounced Shack-SHOO-kah), and post what your phone thinks you’re trying to say (mine thought I said “Shack sugar” and “Suction Cup”). Now then. 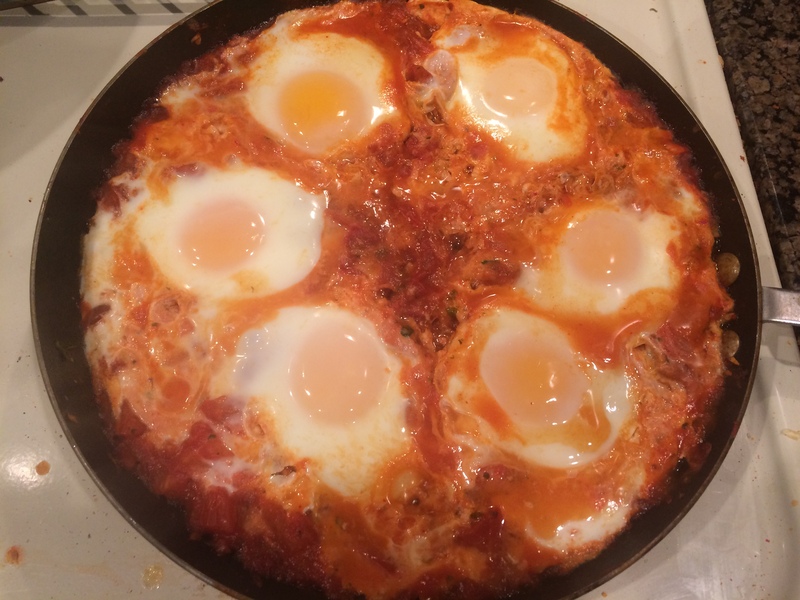 Shakshuka is one of those wonderful recipes that doesn’t require any adjustment at all to be ultra healthy, and also faithful to the proper recipe. @beth-bueschler51 (on Weight Watchers Connect) shared a picture of shakshuka she had, and shared the recipe she was given (thanks again, Beth!) The recipe didn’t have all the measurements for a proper recipe, so I’m posting what I did. I also added ground chile de arbol for some heat, which is a bit like cayenne pepper with character. The only ingredients that have any points at all are the oil and tomato paste, but they’re in such a small quantity that this still comes up as a 0-pointer (and a wispy 132 calories per serving). I had mine with the #2ingredientnaanbread I made previously. Saute onion in a large pan on medium heat for about 10 minutes or until softened. Add garlic and stir constantly for 1 minute. Add oregano, basil, salt, and pepper, and stir constantly for another minute. Add tomatoes and tomato paste and stir to coat. Bring to a boil, then lower to a simmer and cook for 10 minutes. Make an opening for one egg, and crack the raw egg into the opening. 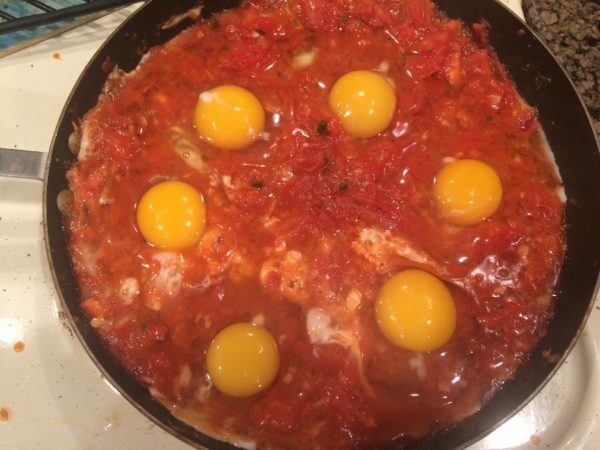 Create openings and add eggs one at a time in a ring around the outside of the pan. Cook for another 10 minutes with the cover on or until the eggs are done to your liking. Serve with my naan bread or other bread. I have two teenagers who keep things very busy around our house during the daytime. I also work long hours at Ford Motor Company, and I do want to spend time with my family every day. If I try to cook when my kids have their friends over, I'm certain to be interrupted. In other words, my available times for cooking are very limited. I don't want to give up on anything I love - my family, my job, my cooking - so I do most of my cooking after everyone has gone to bed. My wife is a teacher, so this can be very late at night during the summer. Sometimes, I don't get started with my prep work until 12:30 a.m. Am I crazy?? Maybe. I'm also constantly working on healthier ways to prepare food. I deconstruct every recipe I like, and try to make it with healthier ingredients. The big challenge is keeping the food tasty. I believe it's possible to enjoy what you eat and still be healthy. I lost 30 pounds in 6 months largely by preparing my own food, following Weight Watchers, and exercising. I'm also a frequent participant on http://www.cookingbites.com/; this is the nicest bunch of talented cooks you'll find anywhere. They'll happily welcome you into their community. I assure you that your cooking skills will improve when you've seen what the people on this forum deliver on a daily basis.